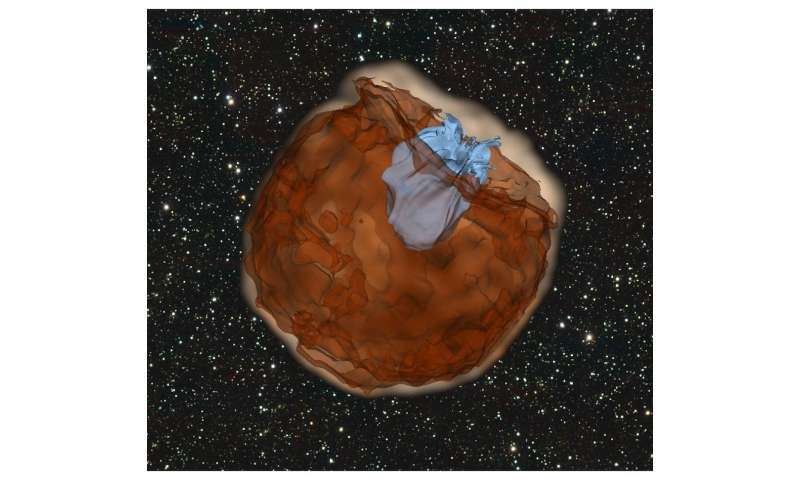 Astronomers at Las Cumbres Observatory (LCO) are part of an international team of scientists who used NASA's Kepler satellite to catch a rare glimpse of a Type Ia supernova minutes after explosion. The supernova, named SN 2018oh, was brighter than expected over the first few days. 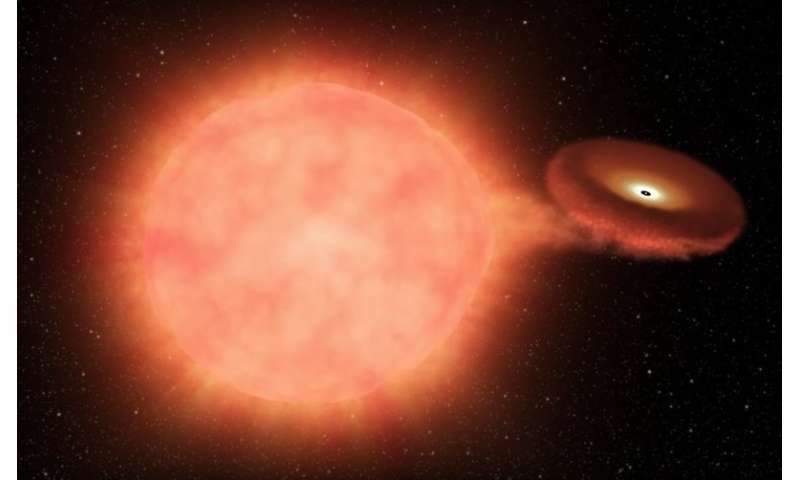 The increased brightness is an indication that it slammed into a nearby companion star. This adds to the growing body of evidence that some, but not all, of these thermonuclear supernovae have a large companion star that triggers the explosion. Las Cumbres Observatory (LCO), based in Goleta, California, is a global network of 21 robotic telescopes that obtained some of the best data characterizing the supernova in support of the NASA mission. Wenxiong Li, the lead author of one of three papers published today on the finding, was based at LCO when much of the research was underway. Five other LCO astronomers, who are affiliated with the University of California Santa Barbara (UCSB), also contributed to two of the papers. Understanding the origins of Type Ia supernovae is critical because they are used as standard candles to map out distances in cosmology. They were used to discover Dark Energy, the mysterious force causing the universe to accelerate in its expansion. Astronomers have long known that a supernova is the explosion of a dense white dwarf star (A white dwarf has the mass of the sun, but only the radius of the Earth; one teaspoon of a white dwarf would weigh roughly 23000 pounds) What triggers the explosion is less well understood. One theory holds that the explosions are the merger of two white dwarf stars. Another is that the second star is not a white dwarf at all, but a normal-sized or even giant star that loses only some of its matter to the white dwarf to initiate the explosion. In this theory, the explosion then smashes into the surviving second star, causing the supernova to be exceedingly bright in its early hours. Testing the theory was deemed so important to NASA that some of the last few months of the life of the Kepler satellite were dedicated to looking for this phenomenon. Kepler's ability to take data over large regions of the sky every few minutes was unique and it allowed scientists to observe this type of supernova at the earliest moments in the explosion—the earliest ever seen. When the Kepler satellite observed a supernova, it needed support from other instruments. Because the satellite measures just the brightness of light and only sees in black and white, astronomers also used ground-based telescopes to watch the explosion in color and to obtain spectroscopy to reveal its chemical signatures. Regular ground-based telescopes do not have the massive field of view of Kepler and are restricted by the rotation of the Earth—observations are limited to local nighttime. Las Cumbres Observatory, with its network of telescopes all over the Earth, always has telescopes ready in the dark. The LCO network, like Kepler, can stare at the same spot for 24 hours and more. "Kepler and Las Cumbres Observatory's capabilities are so complementary, I've been dreaming about using them together to address the origins of Type Ia supernovae for years. It is amazing to see it finally happen," said Andy Howell, who is head of the supernova group at LCO, a member of the faculty at UCSB, and a coauthor on two of the papers. The Kepler satellite normally points backwards in its orbit, away from Earth. NASA decided that this was necessary both to shield the satellite's optics from debris and to avoid the glare of Earth overwhelming the sensitive detectors. Targets seen in this direction from Kepler are not visible from the ground-based telescopes for very long. With Kepler nearing the end of its life, NASA decided to take the risk of pointing the telescope forward in its orbit. This allowed LCO to simultaneously take data while Kepler was observing the supernova. Howell added, "It really speaks to their spirit of discovery at NASA that they took a risk in the name of science with Kepler. It paid off." This is not the first time that distortions in the early light of thermonuclear supernovae have been seen. Similar effects were observed in supernovae in 2012, 2014, and 2017. Las Cumbres Observatory was the only facility to have played a role in all of these studies [see the story here]. The interpretation of the results has not always been straightforward. The event in 2012 had sparse data. The one in 2014 was a very unusual supernova. The one from 2017 failed to match other theoretical predictions associated with a supernova having a large companion star. Even the new supernova is not without controversy—some scientists on the large international team think other explanations can account for the strange early behavior of the supernova. "This was so exciting because it was a rare case that as observers we got to go look for something that had been predicted from computer simulations," said Curtis McCully who is a scientist at LCO and a coauthor on two of the papers. Further observations of SN 2018oh and other supernovae like it may settle the controversy over its strange behavior in the early days just after its explosion. While NASA's Kepler is out of gas, Las Cumbres Observatory is just getting started. McCully added, "With new technology like the LCO network of robotic telescopes and Kepler spacecraft, we have moved out of the era of still photographs to motion pictures of the universe: it's such an exciting time to be in astronomy as we search for what really goes bump in the night."